Click image to access portal. 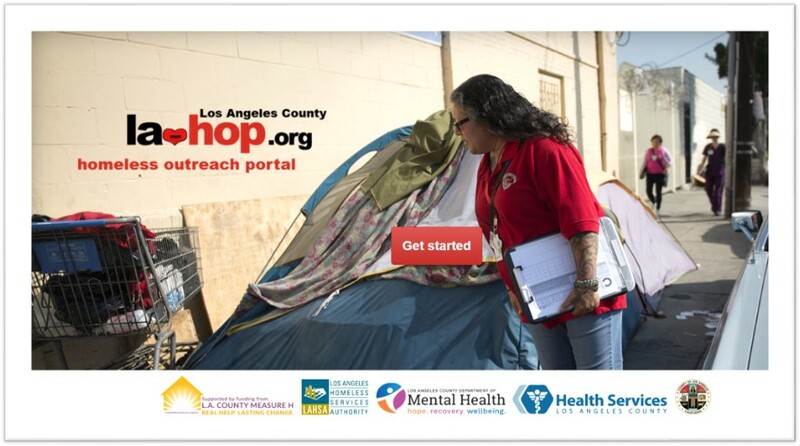 LOS ANGELES – The Los Angeles County Homeless Initiative and Los Angeles Homeless Services Authority Thursday unveiled an online portal for the general public, first responders and service providers to provide information on homeless persons on the street and request outreach. The portal, dubbed LA-HOP, is funded by Measure H, the county measure approved by voters last year and expected to raise $355 million annually for 10 years for homeless programs through a sales tax increase. Officials said the portal takes the guesswork out of figuring out geographic boundaries by routing requests and tracking the response. An outreach coordinator in each region serves as the “air traffic controller” for all requests and deploys the most appropriate outreach team to the site, which officials said will reduce response times to those in need. The tool can be found at la-hop.org. 10 comments for "Online portal launches to streamline homeless outreach requests"
How does the late President Reagan have anything to do with our current homeless situation? He created the economic policies that eventually produced the problem. This is what happens after thirty years of waiting for a “trickle down” that is apparently never going to happen. It’s time to acknowledge that Reagan was wrong (or evil and knew what he was doing, which is a distinct possibility), and the outcome of his policies is the vast and rapidly widening disparity in wealth distribution. I seriously doubt that Pancakes was referring to that, but it is a relevant answer to your question. Most homeless I meet are either drug addicts or alcoholics or have become mentally ill due to years of abuse of one of those 2. Can’t see how we can blame Ronald for that. I blame Nancy and her “Just Get High” campaign. He ordered public mental health facilities to close down, many housed veterans with severe PTSD and drug/alcohol abuse issues. Look it up, Reagan made a huge mistake that we are still dealing with. I disagree with your statement..not all homeless are mentally ill and locking up human beings is not the answer..help has to start somewhere and if people at mental agencies actually did there jobs a little better some of the homeless you mention are mental would actual have housing..I myself attend DMH(Department of Mental Health) and I have seen and talk to many of your so called Mentally homeless people and the agencies are not helping them try to get housing or even try to give them resources that actually help..Mostly all homeless shelters have been closed down and won’t open till winter and that’s if they decide to actually open them..It’s been over 100° out here in the Antelope Valley and one thing I see the cities actually do is trash all of the homeless belongings including tents and than the homeless have no place to get out of the sun..Maybe if the community actually spent a day seeking out homeless persons and actually help provide medical, housing and food all at once and not in a long long timeline away do it immediately…All homeless can be helped and taught to become self sufficient..We have many many empty lots that tiny homes can be built on and used for housing for the homeless..It has to start somewhere! Hey Also I like many people in this world are Mental in some way or another..Myself I suffer Depression..After hearing what you had to say maybe you have some issues.. Homeless are persons too. IDIOT! I’m homeless and I am not mentally ill. At least not yet! I am a Published Poet, Artist, Second Degree Black belt, and I am an Artist. I am homeless because my Grandmother who raised me as a single parent suddenly died resulting in our home that we lived in for 20 years, the car we shared, and some other things-all without even 24hrs notice taken from me! Sometimes [removed] happens to mentally healthy people!